For Buddhists and non-Buddhists alike, A Spiritual Renegade’s Guide to the Good Life, Lama Marut voices the next generation of spiritualism by addressing today’s need for fearless honesty, practicality, and simplicity, and offering meditations and action plans designed to incite true, unpackaged happiness. 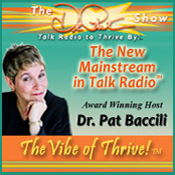 In her various roles in the human potential field as coach, teacher, adviser, inspirational speaker, consultant, and internationally acclaimed radio personality Dr, Pat has helped thousands of people dramatically change both their professional and personal lives. She has helped them confront the long-held beliefs that have held them back, see themselves as Crust-Free, and realize that nothing stands in the way of successfully achieving their heartís desires.